Welcome to this awesome, awesome event! This is a huge prize pack, that would do a huge thing for anyone. I can't even count how many kitchen gadgets we have, that could desperately be replaced. 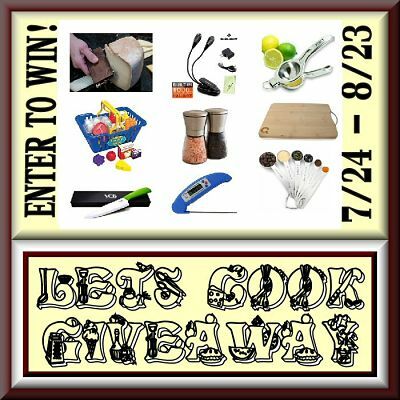 This is an awesome giveaway, just filled with stuff that everyone could use. Good luck everyone, and thanks for stopping by! Welcome to the Let's Cook! Giveaway! The Grand prize package for this event, is worth over $300! "Enter to Win One of These Two Incredible Prize Packages! There's Even Something For the Littlest Cook on Your List! "★ BONUS AND UPGRADED. Free AC Adapter, USB cord, Multifunction Clean Cloth Included. 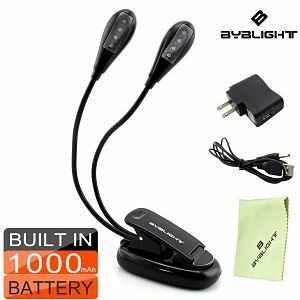 Featuring the Rechargeable 1000mAh Lithium Ion built in battery, NO MORE BUYING BATTERIES! ★ LIFETIME WARRANTY - 100% Money Back Guarantee - RACK YOUR BRAIN FOR A GIFT ? CHOOSE IT ! You Won't Find Another Better - Get More Than Your Expected ! These easy to position and reposition lights are perfect for getting more light where you need it. The nice size of the clip makes it simple to attach to the side of a bowl, a cabinet handle, a book, grill, or just about anywhere that you want. I don't have enough light under my cabinets at night so I found it very helpful to clip this light onto my cutting board while doing prep for dinner the other night. I found the well built clip to be strong and that the lights stayed in the position that I set them at. ★ SAY NO TO COOKING NIGHTMARES. Introducing the elegant and stylish measuring spoons, A perfect set of 6 stainless steel, highly satin brushed with best quality, Look amazing and easy to clean plus the weight handle making measuring out dry ingredients easy and accurate measure marking in different spoon sizes. long lasting and durable and used by professionals. ★ YOUR FAVORITE MEASURING INGREDIENTS. 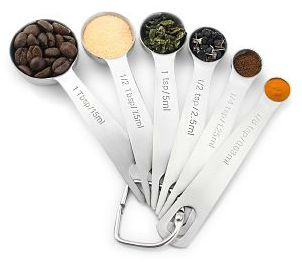 The 6-piece 1Easylife Stainless-Steel Measuring Spoon Set is designed with innovative round-shaped spoon heads that reach into narrow spice jars and other small containers. These spoons are conveniently connected by a small ring which helps to keep the spoons together as a set after a full day of baking or cooking. 1Easylife includes 6 measuring sizes: 1/8-tsp, 1/4-tsp, 1/2-tsp, 1-tsp, 1/2-Tbsp. and 1-Tbsp. With each measurement conveniently marked on the handle of each spoon, there's no guesswork when adding spices to your dishes. Dishwasher-safe. ★ NO HASSLE, 100% LIFE TIME WARRANTY. We offer 100% life time warranty to make you happy and satisfied with our product, If for any reason you're not completely satisfied, return your Stainless Steel Measuring Cups for a No Questions Asked full refund. I've have had a set of name brand plastic measuring spoons since I set up house keeping more than twenty years ago. Getting me to part with them wasn't going to be easy, but always willing to try new things I gave these a test drive. I found the 1Easlife measuring spoons to be nicely weighted and with the length of the handles I was able to reach into containers with ease. I really like that they take up much less space than my old set and are much easier to get clean. After comparing the two it may be time to retire my old ones. PREVENT OVERCOOKING - Don't ruin an elegant meal or backyard barbecue by serving dry, tough, overcooked meat. If you only use cooking time to determine doneness, you could end up with some pieces being cooked perfectly and others over or underdone - not to mention burnt! You can easily avoid this by using a meat thermometer. When cooked to the proper temperature, meat will stay juicy and tender. PREVENT ILLNESS - Using a food thermometer greatly reduces your risk of foodborne illness associated with bacteria. The harmful bacteria found in contaminated food can only survive up to a certain temperature, and using a food thermometer is the only way to be 100-percent sure that your food is safe to eat. EASY TO USE - Large LCD display for easy-to-read numbers - No More Squinting! Function buttons include On/Off, Hold and °C/°F conversion. Auto shut-off after 10 minutes saves battery life. Uses (1) AAA battery. MEASURING RANGE AND ACCURACY - Instant read in only 4-7 seconds accurately measuring range of temperatures between -58°F-572°F (-50°C-300°C). Long stainless steel probe to keep your hands safe from heat! MONEY BACK GUARANTEE AND LIFETIME WARRANTY - When you order today, you are protected by our no-questions-asked Money Back Guarantee and World Class Customer Service! My thermometer arrived the day I was making fried green tomatoes so I used it to make sure that my oil was at the proper temperature. If it's to cold the tomatoes get mushy before the breading gets brown and if it's to hot the outside burns and the tomatoes are hard. I had bragged to my west coast boyfriend how awesome mine were so getting it right was important. My reputation as a southern cook was on the line! I found that this thermometer was easy to use. I just put one AAA battery in it, turned it on, and flipped open the probe. When I placed the tip in the oil I had a reading in seconds and with the nice big readout I didn't need my glasses to see it. I am very happy with this product and would recommend it to anyone with confidence. Carefully handmade in the USA from beautiful, natural wood/brass/stainless steel. Adjustable tension, stainless steel wire stays tight to carve neat, enticing, wavy slices every time. Comfortable grip for all ages, hand-held, light-weight, and simple to use. Thin or thick slices carved, depending on how you angle the slicer into the cheese. Safe for children. No sharp edges. Makes snacking and eating fun! Perfect tool for creating sandwiches, pizza, crackers, snacks, use at parties and picnics. . . Awesome gift at low cost for Christmas presents, birthdays, weddings, office, or any special occasion. Gift Box comes with each one for convenient storage. Durable quality will last for years and won't wear out. Choose from wild cherry wood, black walnut, or try both! With so many of or utensils now having plastic composite handles I hold onto my old ones that have real handles and find myself going back to using them. I just love the feel of wood and have been known to spend a lot of money just to purchase one brand of knife that has a wood handle. So when my cheese slicer arrived I couldn't wait to test it. It works for all types of cheese so I got out some block cheese that I had in the fridge to see how well it worked and felt in my hand. It worked wonderfully and what fun slices! We often do cheese and fruit for snacks and since it is safe for the little ones to use I can't wait for my grandchildren to come over at use it to make their own fun snacks. HIGH QUALITY STAINLESS STEEL - This Premium Lemon squeezer made out of the strongest material available and WILL NOT BREAK when squeezing. This hand polished Citrus Juicer will not peel or rust. 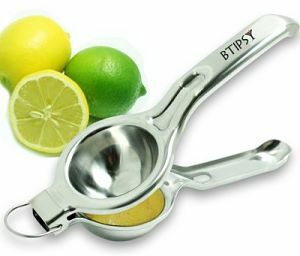 SO EASY TO USE - No matter if you choose to squeeze lemons, limes or blood oranges, this Btipsy Lemon Squeezer will make your job so easy. Fits for both kids and old men, This Squeezer is so convenient to use and with an effortless squeeze you can get every bit of juice out of the fruit. EASY TO CLEAN - Once finished using the Lemon Juicer, it's very easy to clean it by hand or just placing it inside the dishwasher since this Lemon Squeezer is DISHWASHER SAFE. So feel free to clean it whatever you'd like. The all metal construction makes this juicer strong and durable. Plus, since it is made out of stainless steel I get longevity and don't have to worry about it rusting. With a very small kitchen I have very limited drawer space in my home. The hook makes it easy to hang off off one of my many cup hooks that are on every open spot in my kitchen. We eat a lot of fish and salads that we use fresh squeezed lemon and orange for and having it hanging and not hidden in a drawer keeps it handy. I found that the nice big handles were easy to grasp and squeeze so that I could get all the juice out. This eco friendly cutting board can handle just about everything in your kitchen, from slicing cheese to carving bone-in beef roasts. Easy to clean and maintain - Easily wash and clean off bacteria and food particles with some hot water and soap then let it air dry. 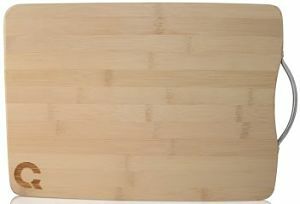 In the last few years, bamboo has become one of the most popular materials for cutting boards because of it's low maintenance, superior health and sanitation qualities. Not only does it look good but it is a green, renewable and earth friendly material. The hardness of a bamboo cutting board, plus the fact that it very resistant to bacteria makes it a must have in my kitchen. I tested my new board by cutting some yellow squash, zucchini, and cucumbers with a brand new ceramic knife and could not find one mark from doing it. All you have to do is make a habit of never letting it soak and wiping it dry after washing and with this easy, proper care this board will stay beautiful for years. Sharpness - Our ultra-sharp advanced ceramic blade will retain its original sharpness up to 15 times longer than steel blades. Purity - Rust-proof, will never brown foods, impervious to acids and oils, no metallic taste or smell. Advanced ceramic is a pure & healthy alternative. Lightweight - Typically half the weight of metal-based knives, offers total ease of use with the most difficult cutting tasks. Ergonomic handles produce a well-balanced, highly controlled grip. Easy to Clean - The fact that advanced ceramic does not absorb any food element, allows just a quick rinse and wipe with a kitchen towel. 8 Inch Chef Ceramic knife For slicing fruits, vegetables and boneless meats. This is my first ceramic knife so I wanted to know what some of the advantages of a ceramic knife were. I found out that they include hardness, ceramic is second only to diamonds; weight, it's much lighter than metal; durability, because these knives keep their razor sharp edge and will not wear out like metal; no metal means no rust; and the ability to resist stains and odors. Because each ceramic knife goes through a long manufacturing process which makes it high end you can expect quality and longevity from your knife. I tested my new ceramic knife by cutting some yellow squash, zucchini, and cucumbers. Even with difficulties from injuries with my hands I found the handle was very easy to hold and grip. It sliced the veggies with ease and with very little pressure from me. 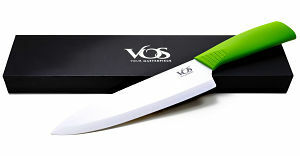 With my garden producing lots of vegetables this will be my new go to knife for prepping them. 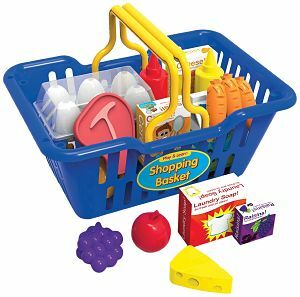 Kids can enjoy the complete shopping experience with the Play & Learn Shopping Basket! Our kid-sized Shopping Basket is easy to carry with its lightweight plastic construction and big handles. Fun Accessories include a variety of plastic and cardboard food items. Ages 3+ years. 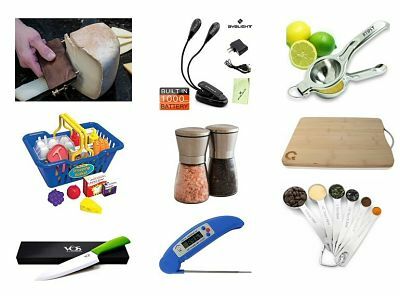 This is perfect for getting the little cook in your home playing, imagining, and creating. The basket is made from thick plastic making it strong and durable. The food that comes with it is sure to keep them entertained for hours. I've ordered many imaginary milk shakes and french fries playing drive thru with my grandchildren so I know they are going to love playing grocery with all these fun items. I really like the bright and bold colors. They are very appealing and fun. HIGH QUALITY GLASS AND STAINLESS STEEL GRINDER SET This glass and stainless steel salt and pepper grinder set features a modern design and is stylish and elegant enough for kitchen-to-table use! 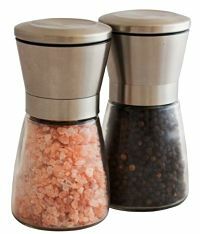 Each set contains one salt grinder and one pepper grinder which can hold 3/4 cup of salt, peppercorns or any other spice, in its generously sized glass reservoir. *Salt and pepper not included. BUILT FOR CONVENIENCE AND FUNCTION Unlike other grinder sets, this pair has their grinding mechanism on the top of the grinder, ensuring salt and pepper ends up only on your food -- not all over your table. The ceramic grinder is non-corrosive, won't absorb flavors and is easily adjustable from a fine to coarse grind. EASY REFILLING WITH NO MESSES Don't you hate constantly having to refill your salt and pepper grinders? Standing about 5 1/4 inches tall this set is the perfect size to cut down on constant refills without being bulky. When you do have to refill, the clear glass bodies will let you know when it's time! The stainless steel top easily screws off revealing a wide opening for easy and mess-free refills. CUSTOMER GUARANTEE We're confident you'll love our Dual Refillable Salt & Pepper Grinders. However, if you're not completely satisfied, we'll give you a 100% refund within 90 days of purchase--NO QUESTIONS ASKED. We have the best customer service on Amazon, and YOU, the customer, are our top priority. Add a set to your shopping cart today for a risk-free culinary experience! I just ordered this beautiful set two days ago and was so excited to try them. Don't they look amazing? They arrived yesterday and look even better in person! The attention to detail and quality is obvious. The Kitchen Classique Grinders are a nice large size so they will hold a lot more than any of the previous grinders that I have owned. I found it really easy to open each grinder to fill it. Just unscrew the metal part from the glass, fill, and screw it back on. Each grinder has a lid to keep it from spilling accidentally, or for grinding what you need then adding it to your food plus you can adjust the coarseness to your liking. I am very happy with this product and would recommend it to my friends and family with confidence." Disclaimer: PaulaMS' Giveaways, Reviews, and Freebies nor any blog promoting this giveaway, is not responsible for the awarding of the prize. Sponsors are responsible for prize fulfillment. Disclosure of Material Connection: PaulaMS received the products mentioned above for free to facilitate the writing of the reviews. Some of the links on this blog post are affiliate links. This means if you click on the link and purchase the item, I may receive an affiliate commission. Regardless, she only recommend products or services that she uses personally and believe will add value to readers. I am disclosing this in accordance with the Federal Trade Commission’s 16 CFR, Part 255: Guides Concerning the Use of Endorsements and Testimonials in Advertising. Everything in this prize package is awesome! Would love to win this giveaway!! There are so many cool prizes. I'm keeping my fingers crossed for this one. I love the pink sea satl grinder for the salt and pepper set! HUGE Sale at Masala Baby - 50% Off of Everything! Svan Lyft Booster Seat (In Lime) Review! Free Blogger Giveaway Event Opportunity!